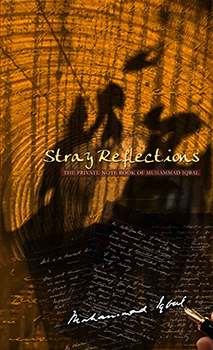 Note: Sir Muhammad Iqbal, Stray Reflections: The Private Notebook of Muhammad Iqbal, ed. by Javid Iqbal and Khurram Ali Shafique (Lahore: Iqbal Academy Pakistan, 2006), p. 258. Bibliography: Iqbal, Sir Muhammad. Stray Reflections: The Private Notebook of Muhammad Iqbal. Edited by Iqbal, Javid and Shafique, Khurram Ali. Lahore: Iqbal Academy Pakistan, 2006.